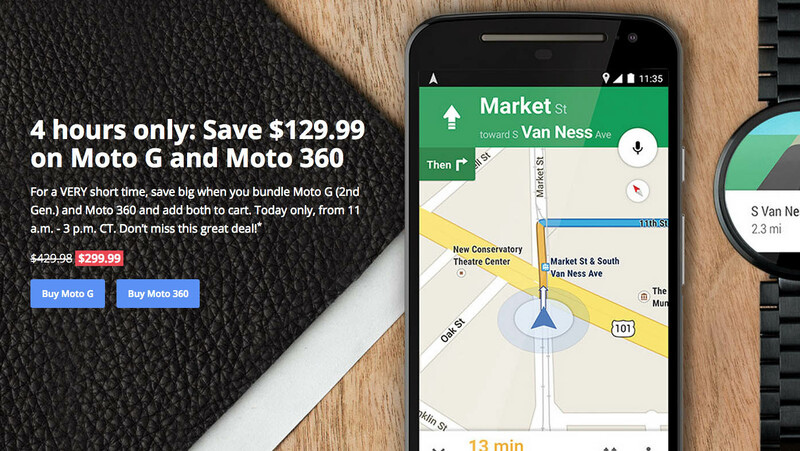 Motorola is currently hosting a 4-hour combo sale that will land you a Moto G (2nd gen) and a Moto 360 for just $299. That’s $129 off, in case you were wondering. The Moto G is the current version, which unfortunately, is a 3G-only device. Still, it’s a great value for someone in need of a smartphone who doesn’t have a big budget or reason to buy a flagship. The Moto 360 is well, the Moto 360. It’s the best Android Wear watch you can buy for now. The deal is only live until 3PM Central, which is 4PM Eastern or 1PM Pacific.